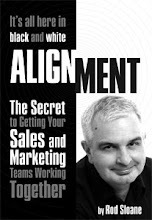 Sales and Marketing Alignment Blog from Rod Sloane: Is there More to Marketing than Lead Generation? Who generating them in your business? Marketing or Sales. Who is responsible for the quality of those leads? It's all Marketing's fault isn't it. Those guys live in an ivory tower and are out of touch with real world of sales, aren't they? But doesn't marketing have an even more important role than lead generation? Marketing's real role is to come up with a single idea that you tell as a message, a story. Tell your story and you will start to attract the right leads. All you have to do is the your single idea right.